Few minutes ago, I received email from young friend from Dubai reminding me to update my PlayStation3 system. Version 2.6 release on January 21st, 2009. I will update it as soon as I got home to see how better it should be. Do not perform updates using any data other than the official update data provided by Sony Computer Entertainment over a network or on disc media, and do not perform updates by methods other than those described in the product documentation or on this site. If an update is performed using data from another source, by another method, or with a PS3™ system that has been altered or modified in any way, the PS3™ system may not operate properly and may not be able to install the official update data. Any of these actions may void the PS3™ system warranty and affect your ability to obtain warranty services and repair services from Sony Computer Entertainment. The system software included within this product is subject to a limited license from Sony Computer Entertainment Inc. Refer to http://www.scei.co.jp/ps3-eula for details. This update is for customers who own PS3™ systems sold in North America. DO NOT update your PS3™ system through this website if you purchased your system outside North America. There is no guarantee of proper operation with other models sold outside North America. 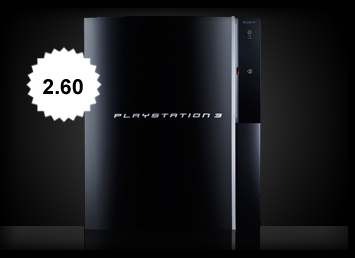 If your PS3™ system software version is 2.60 (or later), you do not need to perform this update. To check the version of your system software, go to (Settings) > (System Settings) > [System Information]. The information is shown in the [System Software] field. Depending on the software title or feature in use, you may not be able to play without first updating the system software. Depending on your PS3™ system software version, the screen images and icons appearing on this website may differ from the actual product. Hopefully things will go well. Few things I did not like about PS3 are Noise (Fan) and Game pricing. For the first issue, it is annoyance, and remind me of old day of iMac G5. (PS3 fitted with PowerPC guts, and I assumed it is something close to what iMac G5 offered), and the second issue, huh... what can I say? Luckily in Asia, you could swap the game data (illegally) with small fees at some game shop.